Over the years, MegaSaw has become a leading name amongst concrete cutting services, not just here in Melbourne, but across Victoria State and in our neighbouring states. We have worked hard to accomplish this and it certainly has not been an overnight accomplishment. But there are certain aspects to our operation we believe have allowed us to maintain our reputation for excellence in this particular area of expertise. But being able to do the work well is not enough to earn a reputation for excellence in this business. We believe there are five particular factors that have contributed to it. There is no substitute for knowledge, experience, skill and professionalism. In our 40 years in business, we have been lucky to have some of the most skilled and professional people in our team, ensuring the highest level of customer service at all times. The consistency in quality in both the work we do and the personable, friendly customer interaction we are famed for, is hugely important to use. Maintaining it requires constant vigilance but through these four standards we insist upon ourselves, that job becomes easier. CSDAA Accredited – We are no rogue operators but a recognised leading concrete cutting service provider within the industry and a member of the Concrete Sawing and Drilling Association of Australia (CSDAA). We are completely accountable so you can have total confidence in everything that we do. It’s a pretty obvious observation but the quality of any job done is heavily dependent on the equipment used to do it. At MegaSaw, we always make sure we have the right equipment so that the job is done right and our reputation as leading concrete cutting service providers remains safely intact. It’s the reason why we choose to use Husqvarna cutting equipment as our primary tools because of their reliability, technologically advanced components and greater efficiency levels. So what are the different types of concrete cutting saws we use on our projects? Well, here’s a breakdown of what we have and how we use it. Hand saws – Arguably the most used of our collection of saws are these hand-held ones. They are so popular because they are hand-held, they are very portable and can be used effectively in places that larger saws cannot get to. These locations include indoor spaces, like storage areas, laundry rooms and interior bathrooms. They are perfectly suited for cutting windows and doorway spaces in existing concrete walls, slashing the time it would take a construction worker to ‘knock through’ the required space – this is especially important when working to tight deadlines. In spaces where ventilation is a problem, we opt for the hydraulic hand saw. This is to remove the fuel fumes that might otherwise build up and make the air unbreathable. These saws have a capability to cut to depths of 210mm. Road or floor saws – When it comes to cutting through large areas of concrete floor, pavement, roads or even bridges, efficiency is a key issue. We use the latest technology to ensure those efficiency levels – in fuel consumption, time and labour required, and in overall cost – is achieved. Of course, when a floor is in a confined location, then the handsaw is usually the best option, but outdoors, where there is space and ventilation, a more powerful saw works best. Once again we use Husqvarna road cutters, a brand that is proven around the world for developing machines that are faster, cleaner and smarter. The powerful modern diesel engines have low emissions and provide fast, efficient sawing. The new, intuitive digital control panel and other smart features help you work more efficiently. Compact and manoeuverable, these powerful machines can cut to depths of just over 370 mm, and is perfect for the range of floor and road-side projects that we take on regularly. With an advanced fuel-efficient diesel engine, it also has a diesel particle filter that keeps CO2 emissions low. Our Husqvarna ring saw boasts lasting power, resilience and high-end technology to ensure the surest deep cutting available (270mm). Meanwhile, the 355mm abrasive blades that our ring saw uses is ideal not just for cutting through concrete, but also limestone, lava rock, slate rock, shale and sandstone. Wall Saws – Whether we are working on a commercial project for major property developers, or on a residential project with homeowners looking for major renovations to be made, the challenge of quickly and efficiency cutting into walls is something we have lots of experience in. But while hand saws are sometimes used by our competitors we know that a specialised wall saw is needed, making them important elements in the arsenal of our concrete cutting service. Wall saws have been developed to ensure precision and efficiency when cutting through a standing wall. This is normally difficult because the face of the concrete is vertical, and keeping a straight line with just your eyes is no easy task. But the Husqvarna wall saw we use is track mounted, allowing it to maintain a straight cut from top to bottom, What is more, the cut can be as deep as 530mm, which means it can make light work of narrow walls. Wire Saws – One of the most recent technological developments in concrete cutting services is the use of the wire saw. Its name might suggest a flimsy machine and in the past it has been associated more with very soft materials like wood. However, advances in wire technology has led to the availability of diamond wire saws which offer all the versatility of a traditional wire cutter but the hardness and cutting efficiency of diamond blades. These wire saws can cut through large, dense concrete blocks and even steel. As a result, MegaSaw is perfectly equipped to safely cut segments from large concrete constructions or structures, like bridges and pillars. The Husqvarna wire saw we use allow for flexible set ups increasing the number of locations they are practical in. Concrete block cutting – The uses of concrete slabs and blocks have many uses, not simply to use in the construction of a home or office building. So, it’s understandable that they would need to be cut to suit a particular purpose. At MegaSaw, we have become one of the leading providers of concrete cutting services because of our expertise in every area of the sector, but we cut our teeth in cutting concrete blocks to size. Once again, we trust in the superior design and efficiency of Husqvarna cutting equipment to ensure the highest quality work is completed for all our clients. So, whether you are installing a concrete post fence, a retaining wall, or a large slab, we can cut and shape to the specifications you require. Getting onsite quickly with all of the necessary equipment on hand is a cornerstone of any efficient concrete cutting services. It does not take a rocket scientist to work that out, but you’d be surprised how many of our competitors place having a fleet of fully-equipped transit vans way down the list. 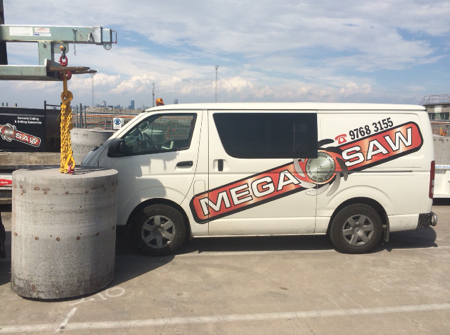 At MegaSaw, we have a fleet of 10 such vehicles, always fully serviced and ready to go, and always fully stocked with the saw, blades and other equipment needed to get the job done. Though small and manageable, the vans have ample space to load our road saws and wall saws onboard without any hassle, while the available interior space is also carefully managed and maintained to ensure every component has a spare on hand. Think about it. When has failure to be prepared ever been a wise move? We are never unprepared and it’s a key reason for our clients to stay with us, knowing they can count on us – whatever the job, and every time. Just like every Australian, we wholeheartedly embrace our responsibility to the environment. And let’s face it, anything to do with construction, demolition and cutting up concrete is not going to be neat and clean by definition. We make every effort to ensure that what we do is done in an eco-friendly way. We minimise our CO2 emissions. For our hydraulic and air-powered saws, we use compressors that enjoy a high level of fuel efficiency, thereby lowering emissions and the carbon footprint. We recycle waste materials wherever possible, with metals and concrete segments sent to be recycled. Recycling concrete can make a huge difference to the Australian environment. We reuse materials too – or at least, send them for reuse, like large metal segments in reinforced concrete. Our stance is pretty simple. A greener tomorrow is a better tomorrow for everyone and we are proud to contribute to a greener and environmentally cleaner Australia. We feel this is the biggest reason we have retained our reputation for excellence as a concrete cutting service provider. It’s easy to point to the projects we have competed, especially the large ones working for major national, international and even government clients, but getting there required a set of values in the first place. Our values have not changed. We started as a local operator and despite our growth, we remain as focused on satisfying the demands of our locally-based clients – be they commercial or residential clients. We are always contactable and always accountable and when it comes to response time, we can confidently say we are unbeatable. In fact, we are so confident that we encourage all prospective new clients to speak to our former clients and get a full report from them. Just check out the work we have completed. 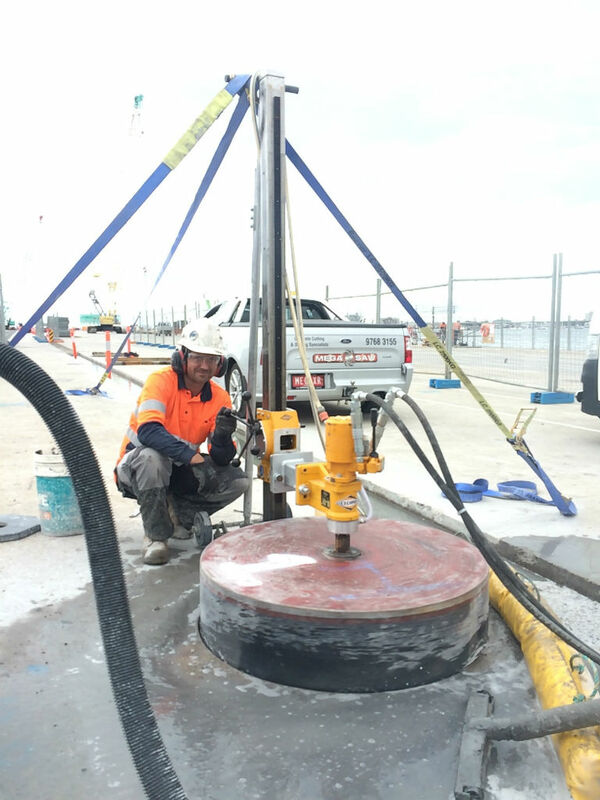 To find out about any of our range of concrete cutting services, including our concrete removal service, why not speak to Steph at 1300 920 419 or email us [email protected].